The Middle Eastern chessboard became far denser this week with one more regional Shiite-Sunni conflict intervened from aboard. As Saudi Arabia bombed Shiite positions in Yemen's capital Sanaa, the US was helping the Shiite siege to Iraq's petroleum city Tikrit, bombing the Sunni therein. Compelled to report both events, the mainstream media was able to vent some difficult questions: are not the US and Saudi allies? Why were rebellions in Syria or Libya supported by NATO and not those in Bahrain and Yemen? And what of the European foreign policy? Missing in action? The support NATO provided to the Sunni against the Shiite governments in Syria and Iraq has unleashed a watershed of events that is slowly igniting the whole region. Old rifts are revived, new are open, Sunni and Shiites seem now unable to cohabit peacefully. Under their feet lie the fields that provide more than one third of the petroleum consumed in the world. 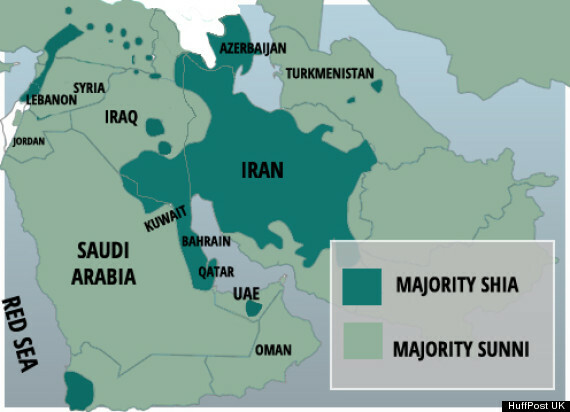 With Iran and Saudi Arabia on opposite shores, the Persian Gulf could be the stage for the most damaging of wars. Arabie-Iran : vers une "Grande guerre"
C'est, entre chiites et sunnites, un combat de titans qui explique bien des convulsions moyen-orientales. À ma droite l'Arabie Saoudite, le plus grand pays du Moyen-Orient, la première économie arabe grâce à sa rente pétrolière, qui abrite deux lieux saints de l'Islam sunnite. Et à ma gauche, l'Iran, l'ancienne Perse, gros pays producteur de pétrole mais aussi l'État plus moderne de la région, avec le niveau culturel le plus élevé du Moyen-Orient. Le combat Iran-Arabie Saoudite n'est pas prêt de cesser car il s'ancre dans des guerres fratricides qui remontent… à la mort du prophète Mahomet en 632. Car il est d'abord théologique, avant d'être territorial et géopolitique. C'est aussi l'histoire d'une revanche, celle des chiites contre les sunnites. Car le monde sunnite est en déclin, divisé entre les djihadistes de Daech, les Frères musulmans et une série de monarchies fragiles. But for the moment, the so called West feels washed in petroleum. Prices keep falling and what recently was touted as a great investment is now haemorrhaging debt. The shale sub-prime is percolating into the US banking industry, creating problems even for big institutions. Citigroup Inc.,Goldman Sachs Group Inc.,UBS AG and other large banks face tens of millions of dollars in losses on loans they made to energy companies last year, a sign of investor jitters in a sector battered by the oil slump. The banks intended to sell the loans to investors but have struggled to unload them even after cutting prices, thanks to a nine-month-long plunge that has taken Nymex crude futures to their lowest level since 2009. The losses mark a setback for Wall Street, after global banks earned $31 billion in fees over the past five years by financing energy-company stock sales, borrowing and mergers-and-acquisition transactions, according to Dealogic. [...] Investment banks helped fuel the oil-and-gas exploration boom of the past decade by making loans valued at about $1 trillion to companies in the energy industry, most of which they sold to investors. As noted in the analysis below, the impact banks are dealing with is for the moment coming from service business. The foreseeable petroleum industry wide banckuptcy is yet to take place. In Canada the tar sands industry is taking a serious beating, with synthetic crude being sold for one third of the cost. Such market can not possibly last long. The collapse in the market for Canada’s heavy crude below $30 a barrel last week is hammering home a harsh reality for the nation’s oil-sands producers: There’s no one to save them this time. Unlike previous market crashes that were relatively short- lived, the combination of persistent oversupplies and weakening demand are dealing a severe setback to what’s been one of the biggest growth stories in global energy markets. Oilsands companies such as Suncor Energy Inc. already have been rethinking major developments that can require more than $10 billion in investment. Now even existing projects are barely covering costs or in a losing position. “This is a major test of the industry,” said John Stephenson, chief executive officer of Stephenson & Co. in Toronto, a money management firm. “It’s going to be sustained, it’s going to be ugly and it’s going to go on longer than people think.” Long a resource investor, Stephenson is right now shorting energy stocks as he bets on more price pain. Over at Energy Matters a guest writer notes the recent slowdown in the Chinese economic activity. This is something regularly highlighted in this review: price and quantity are set by both supply and demand. The United Kingdom is heading to a general election in May. The main development of that story is the apparent disappearance of the Labour party in Scotland, squashed by the SNP. This will likely mean a difficult path to find a ruling coalition in Whitehall. Compounding on the autonomy issues in the wake of the independence referendum is the economic disaster 50 $/b mean for the North Sea petroleum and gas industry. British oil and gas production has been declining for years, but the severe drop in oil prices presented the sector with an existential crisis. The oil majors that operate in the North Sea – Royal Dutch Shell, BP, Chevron – have committed to significant cuts to their capital expenditures. They have reviewed the highest cost production in their global portfolios, and concluded that the North Sea should be on the chopping block. As a result, fears of permanent decline have set in. Without action an estimated 100,000 jobs could be lost. The British government hopes to stave off the worst, and unveiled a rescue package on March 19. The supplementary tax will be reduced from 30 percent down to 20 percent. A separate petroleum tax on older oil fields will be slashed down to 35 percent from the current 50 percent. All told, the tax cuts will cost the British government 1.3 billion pounds through 2020. The CEO of Oil & Gas UK, an industry trade group, said the tax cuts “laid the foundations” for a revival of the North Sea. In Ukraine the precarious peace between separatists and nationalists seems to hold on. However, in the nationalist side things are turning ever stranger with a private army taking hold of a petroleum company in Kiev. Mike Shedlock publishes various letters from his readers clearly indicating a deterioration of the situation among nationalists, towards what it seems a new war front. The western mainstream media remains largely silent about this turmoil. Ukraine’s President Petro Poroshenko warned on Monday that no regional governor would be allowed a “pocket army”, after armed men took up positions around an oil company in which Igor Kolomoisky, the billionaire oligarch and governor, is battling to retain control. The stand-off threatened to escalate into a full-blown clash between the country’s wealthy president and a rival oligarch who has long been one of Ukraine’s richest men but since last year’s Ukrainian revolution has also developed a political power base. Mr Kolomoisky accepted the role of governor of the central Dnipropetrovsk region last year as Ukraine’s new government tried to stabilise the country after the president at the time, Viktor Yanukovich, was toppled by anti-government protests. He has also funded volunteer militias fighting Russian-backed separatists in Ukraine’s east. A few baby steps towards sustainable economic paradigms are worthy of note this week. For insular economies the traditional reliance on diesel fired electricity generation is definitely on the wane, with 100% renewable energy mixes emerging around the world. While Costa Rice is possibly the largest economy to get into this category one should be careful in extrapolating its success elsewhere; the Caribbean geography can not be exported. Clean energy sources have been used to generate 100 percent of the electricity this year in Costa Rica, the state-owned Costa Rican Electricity Institute, or ICE, said. “The year 2015 has been one of electricity totally friendly to the environment for Costa Rica. According to National Electric System figures, during January, February and so far in March (75 days), it has not been necessary to use hydrocarbons to supply the country’s grid,” the ICE said in a statement. Favorable rain conditions at four of the main hydroelectric power plants have helped generation, the ICE said. China has increased its 2015 solar PV target by 20%, in one more action to curb energy imports. While this news points to a new world record in installed PV capacity in 2015, it is also important to note that China not always achieves its targets. China’s National Energy Administration (NEA) has effectively confirmed its solar photovoltaic (PV) installation target for 2015 as being 17.8 gigawatts (GW) of new capacity, following the release of new figures from NEA, according to major media reports in China. The new figures also provide confirmation that the distributed generation goals introduced last year have been scrapped — owing to various reasons, but mostly due to actual installation figures coming nowhere close to previously stated goals. This new target is approximately a 20% increase over its previous 2015 target of 15 GW (or 14 GW if you use an earlier target). Egypt is another country also turning seriously into indigenous renewable electricity sources. It is always important to remind that up until very recently Egypt was a net petroleum exporter and that energy poverty has been hand-in-hand with political turmoil. [...] Stirring discontent, the frequency of electric blackouts are negatively impacting domestic life and industrial development. Urgently wishing to meet the soaring rate of power consumption with a stable supply, an additional 13 GW of capacity must be brought online in Egypt over the next five years. Solar and wind power in Egypt are anticipated to greatly help relieve this pressure. Thanks to a generous feed-in tariff (FIT) announced in September 2014, Egypt will procure 4.3 GW of solar and wind power production by 2017. Midweek there was commentary on the present Coal market and how it may be an harbinger of things to come. One more week went by without a agreement on the Iranian nuclear programme. With the Shiite-Sunni conflict out in the open the outcome of these negotiation is now more important than ever.